Foreign nationals are arrested during a targeted enforcement operation conducted by U.S. Immigration and Customs Enforcement aimed at immigration fugitives, re-entrants and at-large criminal aliens in Los Angeles on Feb. 7, 2017. The Justice Department is suing California and two top state officials, accusing them of interfering with federal immigration efforts by passing and enforcing state laws that hinder U.S. operations against undocumented people. The lawsuit filed late Tuesday in federal court in Sacramento, Calif., points out that the Constitution gives the U.S. government sweeping authority over immigration. Justice Department lawyers argue that California is blocking enforcement efforts by the Department of Homeland Security and imposing other, impermissible obligations on the federal government. Federal authorities said that evades common sense and has the potential to endanger communities in California and beyond. The new federal case represents an escalation of the long-running battle between the Trump administration and California, whose Democratic governor, Jerry Brown, and attorney general, Xavier Becerra, have positioned themselves as ideological opponents to the White House on matters from immigration and climate change to criminal justice. Echoing the tone and favored language of President Trump on Twitter, Gov. Brown issued a statement Tuesday night that called the federal lawsuit "SAD!!!" and a political stunt. Last year, California lawmakers passed three immigration-related laws that feature prominently in the new lawsuit. One bars private employers from voluntarily cooperating with federal immigration officials and requires businesses to notify workers in advance of a federal raid. A second law restricts state and local law enforcement from voluntarily sharing information with the feds about the release dates of undocumented people in their custody. That law also bars the transfer of undocumented people into federal custody. The third law under federal challenge covers state inspections of detention facilities that hold noncitizens in federal custody. The Justice Department is asking for a preliminary injunction to block those three laws. To advance their cause, federal lawyers cite a 2012 Supreme Court dispute, in which the Obama administration sued Arizona over its punitive law meant to crack down on immigrants there. A divided Supreme Court eventually ruled parts of the state law were "pre-empted" under the Supremacy Clause of the Constitution. In essence, the court's five-justice majority said that federal law trumps state law in the immigration area, lest each state develop its own policy toward immigrants. Attorney General Jeff Sessions, a longtime proponent of immigration restrictions, will speak Wednesday at an annual Law Enforcement Legislative Day hosted by the California Peace Officers' Association in Sacramento. "The Department of Justice and the Trump administration are going to fight these unjust, unfair and unconstitutional policies that have been imposed on you," Sessions will tell that group, according to an advance excerpt of his remarks. "We are fighting to make your jobs safer and to help you reduce crime in America." Becerra, a former Democratic representative, will speak to the same group later Wednesday. In his statement, the state's governor took on Sessions. "At a time of unprecedented political turmoil, Jeff Sessions has come to California to further divide and polarize America," Brown said. "Jeff, these political stunts may be the norm in Washington, but they don't work here. SAD!!!" In D.C., senior Justice Department officials said California had acted in "quite obviously novel ways" and that the state laws there were "glaring and in some respects go beyond what we've seen" elsewhere. 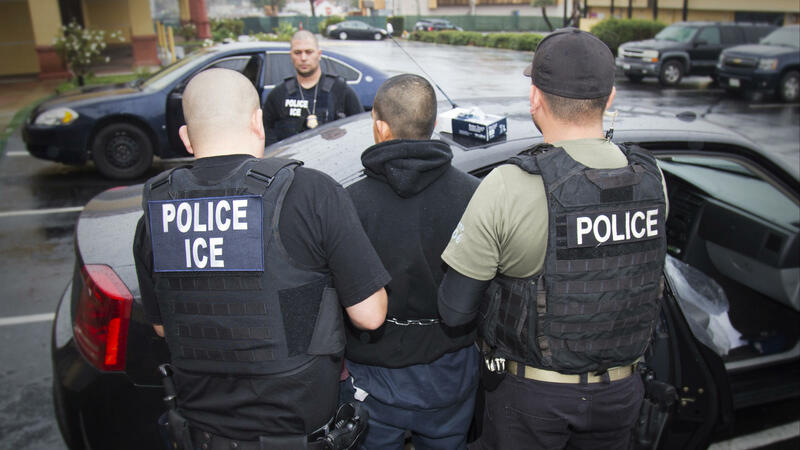 Those officials said the Justice Department is in the process of reviewing other state immigration laws. The U.S. Justice Department is also locked in courtroom battles with California and other jurisdictions over its threats to withhold federal law enforcement grant money from sanctuary cities, which refuse to voluntarily share information with immigration agents. Late-breaking news out of California tonight - the U.S. Justice Department is suing the state and its top officials. The federal government says California is interfering with federal immigration enforcement and violating the Constitution. Here with me to talk about the case is NPR justice correspondent Carrie Johnson. Hey, Carrie. CARRIE JOHNSON, BYLINE: Hey there. KELLY: So no secret that Trump administration officials and California officials have been at odds. What is this latest lawsuit about? JOHNSON: The U.S. Justice Department is targeting three laws that California passed last year, in essence calling them a brazen interference with the federal government's sweeping power over immigration issues. One state law bars employers from voluntarily cooperating with federal immigration agents and forces them to notify employees in advance about any immigration raids. Another law covers state and local law enforcement. It says they're not able to volunteer information to the Department of Homeland Security or ICE agents about release dates of undocumented immigrants in their custody. And the third law covers state inspections of those federal centers where detainees are held. The U.S. Justice Department says all three of those laws are an impermissible burden on federal authority. KELLY: Well, what are the odds that the Justice Department will prevail here? I mean, fair to say that the Trump administration has a mixed record so far in federal court. JOHNSON: Very much a mixed record, but the odds here may be pretty good. It's true the feds have a lot of power when it comes to immigration. An irony alert - the Trump Justice Department is using a precedent from the Obama administration (laughter) here. KELLY: Aha, it all comes around. JOHNSON: Yeah, it does. They're talking about a Supreme Court case from several years ago where the Obama Justice Department sued Arizona over some very punitive immigration laws that Arizona had passed. A divided Supreme Court voted 5 to 3 to invalidate some big parts of that Arizona law on the grounds that the federal government has supremacy here, that the feds trump state law. And the reasoning is that you can't have each state setting its own immigration policy. It's just unworkable. KELLY: Well, and back to this case, which is the latest in a series of skirmishes really between California and Washington, specifically on immigration, I mean, what's the backdrop here? JOHNSON: Yeah, the attorney general of California, Xavier Becerra, is already fighting with the attorney general of the United States, Jeff Sessions, over the Justice Department's threat to deny California access to federal law enforcement grants. The Justice Department says if you don't comply with federal law on immigration and share information about detainees, you shouldn't get law enforcement money from the federal government. And recently, Mary Louise, the mayor in Oakland, Calif., issued a warning to the immigrant community there that the feds were planning a big raid. That really angered the Department of Homeland Security, did not go over well at the Justice Department or the White House either. KELLY: What about Attorney General Jeff Sessions? What kind of role is he playing in this case? JOHNSON: Attorney General Jeff Sessions is no fan of immigration measures that allow more people to come to the U.S.
JOHNSON: In fact, in the Senate, he was one of the biggest foes of immigration that existed back then. He's going to Sacramento on Wednesday to speak with a law enforcement group there. He's going to pledge to fight what he calls unjust, unfair and unconstitutional policies. Also speaking at that law enforcement conference is the attorney general of California, Xavier Becerra, who's no shrinking violet. So expect some big fireworks tomorrow. KELLY: That's NPR justice correspondent Carrie Johnson talking about this late-breaking news out of California. The Justice Department is suing the state and its top officials tonight. Transcript provided by NPR, Copyright NPR.